Karen Bradley speaking in the House of Commons yesterday. THE UK GOVERNMENT’S Northern Irish secretary has said that she didn’t understand “some of the deep-seated and deep-rooted issues that there are in Northern Ireland” when she took the job. 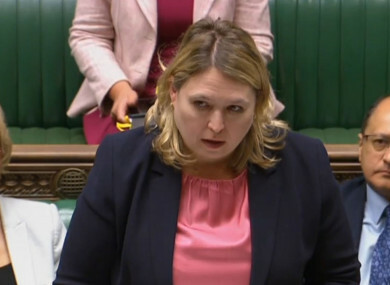 In an interview with The House, Karen Bradley said that she hadn’t realised how elections were fought in Northern Ireland prior to her appointment, and that “people who are nationalists don’t vote for unionist parties and vice-versa”. Appointed to the role in January following a Cabinet reshuffle from Prime Minister Theresa May, Bradley has had to contend with the ongoing lack of a working government at Stormont. It is 20 months now since the government collapsed, and the DUP and Sinn Féin remain at loggerheads with no future arrangement in sight. Both sides have repeatedly accused the other of stalling progress. Yesterday, Bradley announced to the House of Commons that MLAs salaries would be cut by £14,000 and said that the “people of Northern Ireland are suffering” as the row goes on. In the interview, she said that Northern Ireland is a “very different world from the world [she] came from”. She referred to unionist parties competing with other unionist parties in the same community, with the same true for nationalist communities, as something which she was not aware of beforehand. “There are certainly intractable challenges sometimes it feels in Northern Ireland and there’s a lot to understand about Northern Ireland,” she said. The issue of Northern Ireland has proven a particular sticking point in the Brexit negotiations, with some senior Conservatives such as David Davis saying the border problems had been “overemphasised” in the negotiations. The Staffordshire MP said that “with all due respect” to her colleagues, “you cannot possibly understand the issues of Northern Ireland from Westminster”. Bradley also said the restoration of the Stormont Assembly was her main priority. “I am as frustrated as anybody, perhaps more so,” she said. I do lie awake at three o’clock in the morning thinking ‘what can I do now?’. I can’t understand how people who could make a difference don’t do something about it and deal with it, because getting devolved government in Stormont is the only solution for Northern Ireland. There is no alternative. When asked about his reaction to Bradley’s interview, Tánaiste Simon Coveney said he did not know when the interview was conducted. “My time with Karen Bradley has been positive. She is someone who has really made an effort to understand Northern Ireland. She didn’t have a lot of experience of Northern Ireland before being appointed there, but she is an experienced and very smart politician,” he said. He said they would be working together to get the institutions back up and running again, as they haven’t been doing for the last 19 months. Coveney said he plans to meet Bradley again on 17 September. Email “Northern Irish Secretary admits she didn't understand 'nationalists don't vote for unionist parties'”. Feedback on “Northern Irish Secretary admits she didn't understand 'nationalists don't vote for unionist parties'”.